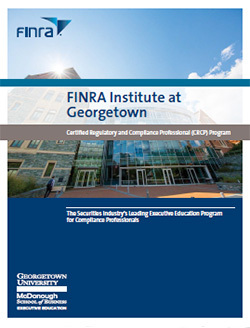 The FINRA Certified Regulatory and Compliance Professional (CRCP)® Small Firm Scholarship Program was developed to facilitate participation from small firms—those with less than 150 registered representatives, for whom the cost of the program may be prohibitive. The FINRA CRCP® Small Firm Scholarship is awarded to five industry professionals from small firms. perform job functions that include compliance and/or regulatory responsibilities. Scholarships are awarded to both the individual and the firm, and are not transferable. Therefore, if a scholarship recipient leaves his or her firm for any reason, the scholarship is forfeited by both the individual and firm. If the individual moves to another small firm, the individual may reapply for a scholarship during the next scholarship selection period. Scholarship recipients are expected to complete the program within two consecutive years, starting the year after they received the scholarship. While a supervisor cannot nominate an employee for the program, they should encourage highly motivated individuals at their firms who meet the criteria to apply for a scholarship. The scholarship covers full tuition and room and board for the entire program. Travel and all other lodging expenses are the responsibility of the recipient. For more details on the covered cost, see the program cost page. A subcommittee of the FINRA Small Firm Advisory Committee (SFAC) selects scholarship recipients through a blind selection process. The subcommittee does not have access to identifying information, such as the applicant's name or the name of the applicant's firm. The subcommittee considers the applicant's experience in the financial services industry, as well as his or her compliance responsibilities in the overall structure of the firm, as described through the applicant's written statement. All applicants are notified when their applications have been received by FINRA, along with more information regarding the selection timeline. If an applicant is not selected as a scholarship recipient, then the applicant is eligible to apply again during the next scholarship period. For additional information, please review the FAQ page. The CRCP Small Firm Scholarship application period is now closed. The next application period is tentatively scheduled to open in mid August 2019, at which time the application form will be posted to the website. If you have additional questions or comments, please call FINRA at (833) 263-4672 or send an email.